Polypipe Ridgiduct Power HV Class 1 cable duct provides stiff yet flexible cable protection and fully complies with ENATS 12-24 Class 1 specification. Ridgiduct Power HV Class 1 cable duct is available in three inner diameter sizes of 100mm, 125mm and 150mm, in lengths of 2m, 3m or 6m and with a black outer and red inner as standard – alternatively the cable duct can be manufactured with a red outer and red inner duct wall. 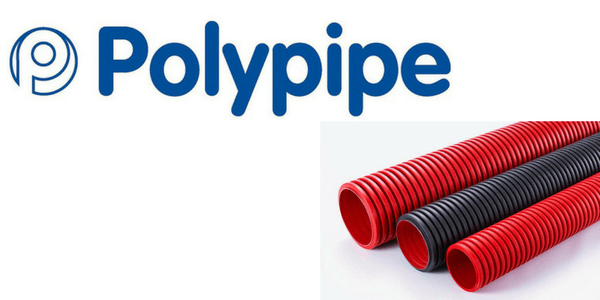 The Polypipe cable duct is supplied with an integral coupler. Double socket bends, couplers and trefoil clips are also available. 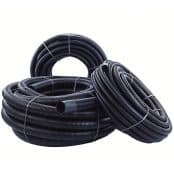 Polypipe Ridgiduct cable duct is approved to ENATS 12-24 for the protection of underground high voltage cables operating at 33kV, 66kV and 132kV. HV cable protection is provided by non-coilable semi-rigid duct and can be manufactured in either single smooth walled or twin walled type. 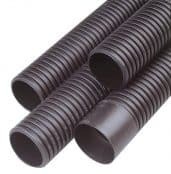 The circular cross section of cable ducts can be cut on site and connected using straight joint couplers to protect HV cables laid into underground cable trenches. T&D also supply cable duct seals compatible with high voltage cable duct to prevent water ingress into 33kV, 66kV and 132kV substations. T&D distribute an extensive range of duct seals including Filoform, CSD and Roxtec cable transits. Ridgiduct Power HV Class 1 cable duct is compliant with ENATS 12-24 Issue 3 which requires that the protective properties of the joints are not less than IP4X as specified by BS EN 60529. IP4X requires the joint as having protection against access to hazardous parts by a wire and should not be considered as an air or water tight joint. Polypipe PVCu Power HV Class 1 cable duct should be considered where a sealed system is required.